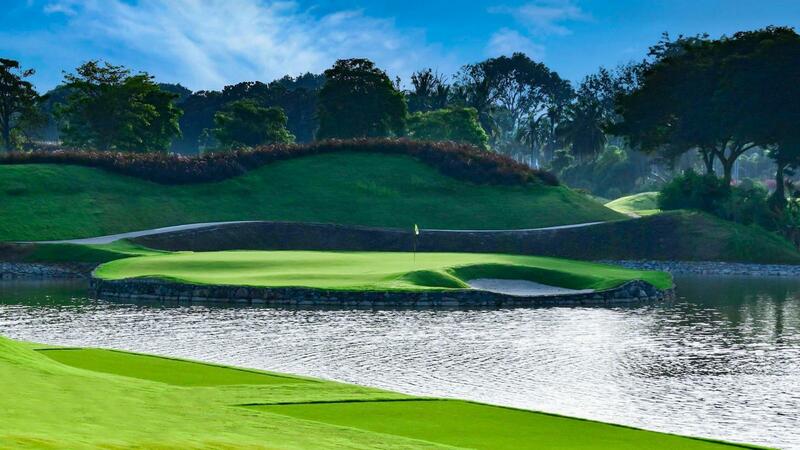 The Classic Course layout, affectionately known locally as “The Beast” due to its formidable challenge, unfolds overdramatic, hilly terrain that is unique to any course in Singapore. The Classic Course has many colorful flourishes. An island green on #17 draws inspiration from TPC Sawgrass and is the site of many dramatic finishes over the final holes. Back to back 600+ yard holes at #13 and #14 demand long and accurate shot making. Just ask Tiger Woods, who spectacularly made his Singapore playing debut on the Classic Course in 2011. The Classic Course is a visually unique departure from most of the courses in the Asia Pacific from the perspective of both design and temperament. Featuring over 150 bunkers, undulating putting surfaces and five dramatic water features incorporated throughout the layout, the course has previously hosted European and Asian Tour championships. First crafted in 1993, it underwent a full redesign in 2010 establishing its dramatic reputation. Most recently in 2017, a full reconfiguration and renovation were undertaken to renew authenticity, soften angles, shape faster greens, enhance playability and modernize fairway and tee grasses. The addition of two new holes and a rerouting of the renovated holes has given it a challenging yet enjoyable feel. Driveable par 4’s, lengthy par 5’s and devilish par 3’s characterize the refreshed layout. The Classic Course plays at 7,471 yards from the Championship tees through 4,878 yards from the dedicated Junior Tees.